Presented at the Global Gaming Expo (G2E) in Las Vegas in September 2014, The Ellen DeGeneres Show Featuring Ellen’s Dance Party and The Ellen DeGeneres Show – 12 Days of Giveaways are two visually attractive slot machines from IGT, themed on one of the world’s most popular television talk shows, which have already created plenty of excitement on the casino floor. These is not the first time that IGT produce casino slots based on popular Movies and TV shows. They have the Jeopardy! and Star Trek slots. In 2011 G2E they revealed the American Idol slot; in 2012 it was the turn of the Family Guy and now, Ellen slot machine. Update: In 2015, IGT introduced another great slot, Breaking Bad slot machine. Even if IGT initially planned to create one slot machine in collaboration with the famous American comedian, they eventually opted for two, giving casino gamers a choice between 12 Days of Giveaways, played at five reels and either 15 or 30 lines, and Ellen’s Dance Party, housing a 432 winning ways format. Both games are hosted by the premium CrystalCore cabinet, featuring a 42 inch touchscreen display that serves as a perfect setting for the thoroughly impressive graphics and animations. The Ellen games were designed as nickel slots, meaning that they have a fixed coin value of $0.05, but it is important to note that you can increase the overall bet per spin using the number of coins. All the glitz and glamour surrounding the Ellen slots will not count for much unless you can find a way to trigger the bonus rounds on fairly regular basis, but once you do unlock them, you will have an opportunity to land some pretty attractive wins. 12 Days of Giveaways Free Spins come with overall multipliers that increase with each new spin, whereas Wheel of Riches bonus gives the gamer a chance to land an instant cash prize that is multiplied by the current Ellen’s multiplier. Last but not least, the famous Know or Go trivia has been incorporated into the games as well. The latest in line of IGT’s branded slots definitely appears to be one of their most accomplished works as the game is both visually appealing and very attractive in terms of bonus rounds offered. Unfortunately, it is currently only available in brick and mortar casinos, but if you ever feel like you need a break from online play, then we can definitely recommend giving the Ellen slots a go in land-based gaming establishments. 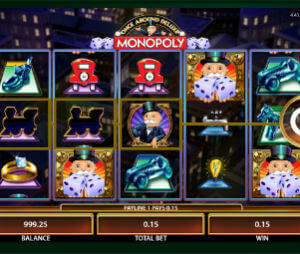 If you are looking to play online, then check our IGT slot machines selection.